An oasis is a body of water, ringed by greenery and beyond that, a lifeless, endless landscape that coughs up dust and sand whenever the wind touches it. It is a globally understood symbol of something precious, fragile and rare. The entire population of the planet: plants, animals and people, are crowded around that symbolic single, lonely body of water. All of us jostling and pushing to get our share. Some are close to the source through sheer luck, others have muscled their way in. This has left those without fiscal or political clout on the fringes, unable to get near fresh water for sanitation, agriculture or even to drink. The coal industry is one of the groups which has managed to muscle its way in. This year, as policymakers work towards a fresh set of universal sustainable development goals, water-efficiency and clean energy will be on the table. This is an important opportunity to establish an integrated water-energy target – a way to put a cap on how much water coal power is able to use. As it stands, coal plants use an incredible amount of water for their operation; electricity is made by burning coal to convert water into high-pressure steam to drive turbines; water is used to cool the steam so it can go back to the boiler again. Water is also needed to wash and process coal before it is burned, to wash coal ash out, to reduce dust levels of the coal stockpile and to extinguish fires. A typical coal plant uses enough water to fill an Olympic-sized swimming pool every three and a half minutes. To put it in global terms, that is about 8% of our total global water demand. What it doesn’t consume it spits out as millions of tons of pollutants into our fresh-water rivers, lakes and streams. We are seeing the effects of this in the US, where a coal slurry spill left 300,000 West Virginians without safe drinking water. In addition, acidic water drainage from old mines can make entire water supplies unfit for people, decades after closure. With more than 1200 new coal plants proposed around the world – and much of the coal expansion in places such as China, India, and Russia where, together, 63% of the population is already suffering from water scarcity – a reckoning must be made in terms of how sensible it is for the coal industry to continue. At the same time, coal burning is a major contributor to climate change, which in itself will further dry up our shallow water supply. 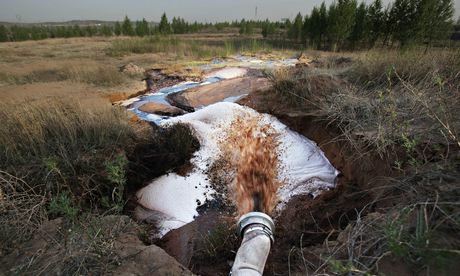 Strong evidence is also emerging that large-scale energy-water conflicts are already unfolding: in China, a coal chemical project in the dry Inner Mongolia region – part of a new mega-coal power base – has used so much water in eight years of operation that according to interviews with local residents, the local water table may have dropped by up to 100 metres, and the local lake to shrink by 62%. In South Africa, 1.63 million people don’t have access to a basic level of water supply. Against this water scarcity the main utility company, Eskom, argues that their coal plants should be exempt from minimum emissions standards because there isn’t enough water to operate their scrubbers – the machinery that “controls” polluting exhaust. The excess emissions of acid rain and smog-generating pollutants from their coal fleet, such as sulphur dioxide, nitrogen oxides and mercury, are projected to cause approximately 20,000 premature deaths, according to Greenpeace research. In India, the energy-water conflict is even starker. According to analysis by HSBC and the World Resources Institute, a staggering 79% of new energy capacity will be built in areas that are already lacking water. Yet, coal is still the energy of choice despite the risk to the lives and livelihoods of local populations. Countries such as Turkey, and others in south-east Asia, which are banking on large coal expansion, should learn from these unfolding coal water conflicts. Energy-water conflicts are avoidable. With energy, we have a choice. Unlike coal, wind and solar energy consumes little water and according to studies may be the most water-efficient form of generating electricity. Responding to climate change and avoiding water security threats hinges on the decisions policy and business leaders make today. As we watch our precious desert reservoir become more polluted and shallow, now is the time to limit the greedy water consumption by the coal industry by shifting to more water-efficient, renewable energies everywhere. This will make the difference between 2°C and 4°C global warming. It will also halt the current unsustainable growth that continues to push billions into the fringes of our oasis.